Free Shipping Included! 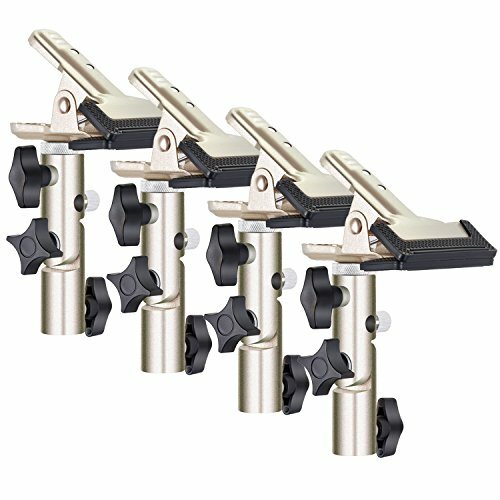 Neewer 4-Pack Gold Heavy Duty Metal Clamp Holder with 5/8'' Stud,Max. 1.96inches/5centimeters Open for Photo Studio Light Stand Boom Arm Reflector Backdrop and More by Neewer at Kmpacting Studio. MPN: 90092071. Hurry! Limited time offer. Offer valid only while supplies last. Description : PLEASE NOTE: Clamp ONLY, Reflector and Stand are NOT included. This Powerful spring clamp is designed for holding studio reflectors. PLEASE NOTE: Clamp ONLY, Reflector and Stand are NOT included. This Powerful spring clamp is designed for holding studio reflectors. The metal framed clip has a strong built inside making it ideally suitable for collapsible reflector. It can be attached to any light stand with a standard 5/8" stud via the enclosed 1/4" & 3/8" transfer screw. Sturdy enough to hold effectively a reflector, you won't scratch or cut anything with the rubber jaws on the clip . It is easy to use and holds very securely. The clip section is fully articulated, so you can set the clamp at any angle and lock it in place. It can be used as a reflector holder, but you can also repurpose it as a umbrella mount, flash mount (add cold shoe) or elbow adapter. It is a very useful accessory for photographers to work alone and when they need something to help supporting a reflector at an angle.